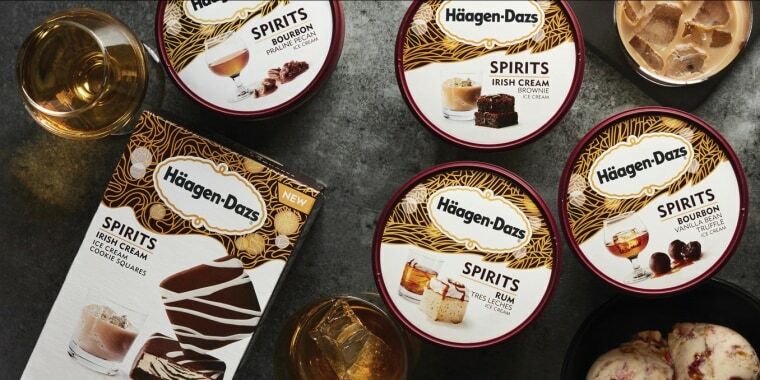 Haagen-Dazs Spirits' line features six new decadent desserts. With beer, bourbon and Irish liqueur, Häagen-Dazs is now throwing pint-sized parties. The ice cream company known for its smooth, decadent flavors is launching seven new sweets, all spiked with a boozy libation. The new desserts are hitting shelves now and will continue to rollout in grocery stores nationwide through April. The flavors will be in Häagen-Dazs scoop shops by March 1. Irish Cream Brownie is a mix of Irish liqueur-infused ice cream with chocolate brownie pieces and chocolate fudge. This flavor will also come in ice cream-cookie squares coated in dark chocolate. Rum Tres Leches is inspired by a traditional tres leches cake, mixed with some rum, of course. The ice cream is infused with white rum and dulce de leche swirls and chunks of decadent cake. Bourbon Vanilla Bean Truffle has a spicy bourbon swirl ribboned throughout vanilla bean ice cream with chocolate truffles. Stout Chocolate Pretzel Crunch is like a dark chocolate stout beer on draft, but this one has been laced with chocolate-covered pretzels and fudge swirls. Bourbon Praline Pecan consists of bourbon-flavored ice cream with brown sugar bourbon swirls and praline-covered pecans. Non-Dairy Amaretto Black Cherry Almond Toffee is an over-the-top (in sweetness, not cream) mix of black cherry jam and almond toffee pieces in a non-dairy frozen yogurt flavored like the nutty liqueur. While these drinks — oops, we mean ice cream! — might sound pretty boozy, you don't have to worry about catching a buzz. The company said in a statement customers can "indulge freely" and do not need to be 21 to purchase. Each container of ice cream is no more than .5 percent alcohol by volume (ABV), which is the same as many popular non-alcoholic beers or the legal limit for kombucha (a popular fermented tea drink). So there's no need to hide these pints in the liquor cabinet.